I am not a huge steak fan! Not for a reason for the beef it is more of texture thing with me. Kind of strange I know but it started as a little girl. 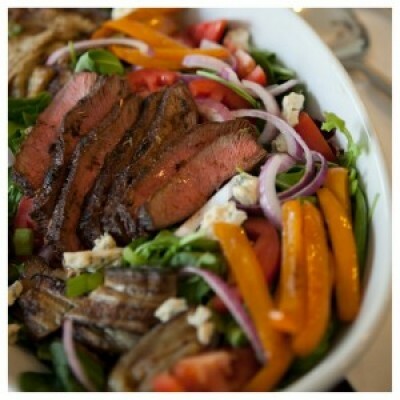 Enjoy my Grilled Skirt Steak over Summer Vegetable Salad! This is great for 2 or entertaining! You can also use the leftover summer vegetables and enjoy a lovely omelet. If you enjoy cheese then add goat or feta! Heat a grill to medium-high. Clean and lightly oil hot grill. In a small ovenproof pot, combine oil, rosemary, and garlic and place on grill. Cook until oil begins to bubble, 2 minutes. Remove herb oil from heat and set aside 3 tablespoons in a small bowl. Brush steak with herb oil, season with salt and pepper, and grill, turning occasionally, about 10 minutes per side for medium-rare (move steak to a cooler part of grill if it begins to overbrown). Transfer to a cutting board and tent with foil. Let rest 10 minutes before slicing thinly against the grain. In batches, brush vegetables with herb oil, season with salt and pepper, and grill, turning occasionally, until tomato skins are split and vegetables are tender, 3 to 5 minutes total. Transfer to a serving platter, along with sliced steak. Add vinegar and honey to reserved oil and whisk together. Season to taste with salt and pepper, then drizzle dressing over steak and vegetables.